Thoroughly cleanses hair for a super shiny finish. With gorgeously fruity banana puree and Community Fair Trade honey. The Cleanser comes in a transparent cylindrical shaped bottle with a black coloured flip cap, where the brand name is embossed on it. 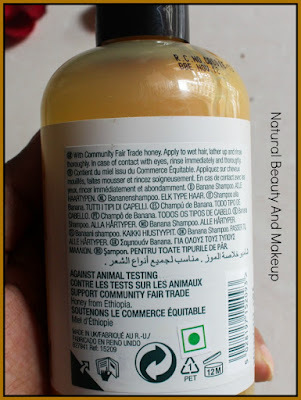 All the necessary information about the product is printed on the bottle itself. 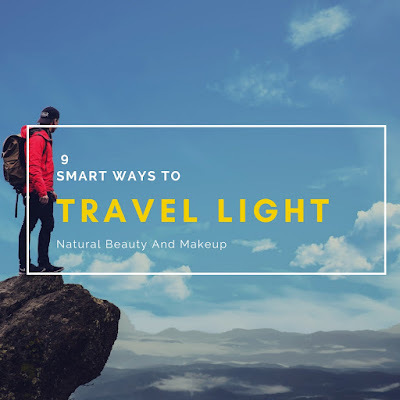 The cap closes tightly so can be easily carried around during travels. TBS says the bottle is made of 100% recycled plastic, great! 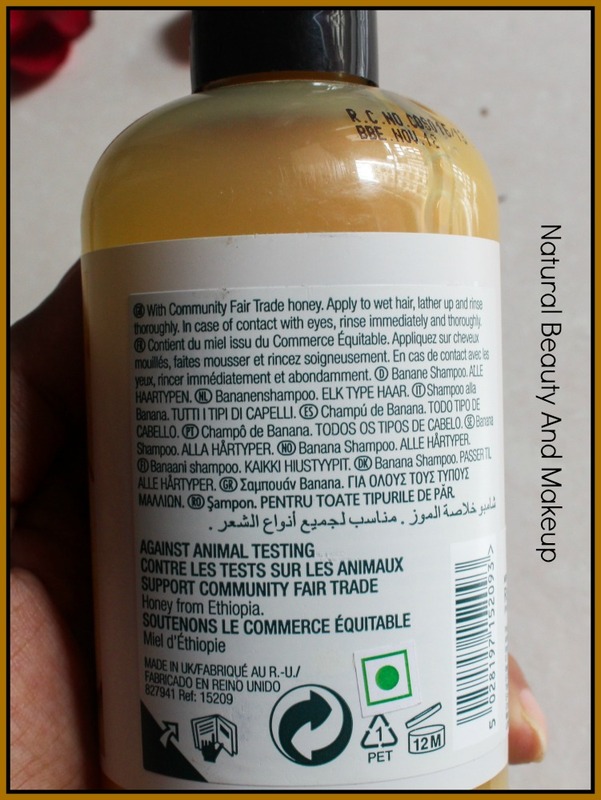 The banana cleanser is yellow in colour and has a runny consistency. The texture of this cleanser is soft and smooth while the fragrance is quite similar to the original fruit banana. 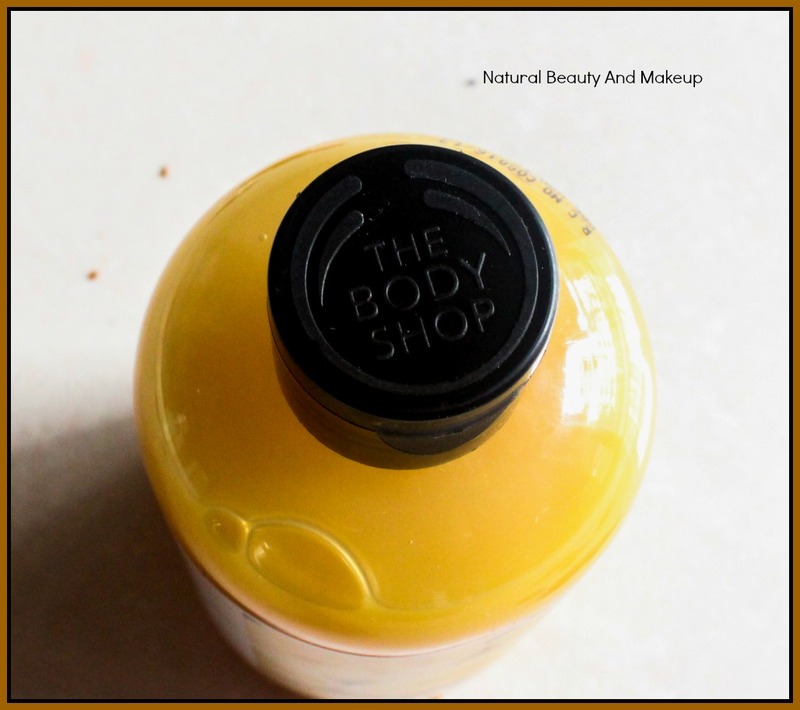 This was the first time I had used any product from The Body Shop. All these years, I have read a lot of good reviews about this brand, especially their hair cleansers. So finally, last year I took a plunge and purchased this shampoo. If you remember my August 2016 haul, it was part of that haul. I didn’t buy its partner, banana conditioner and used it with my other favourite conditioners. Post wash, I took a good amount of Nori conditioner into my palm and applied liberally on the dry hair ends. With this conditioner, I must admit that it worked really well but something was missing, SHINE & LUSTRE EFFECT! Despite being natural products, both the shampoo and the conditioner are enough to make your hair look soft and bouncy. Though, with the chemical-laden deep conditioners, you would get a super soft, silky-wilky hair. But remember, that would cost you HAIRLOSS for sure. Since I have not tried it with its partner banana conditioner, not sure if they together would work like magic! This shampoo is basically designed for thin and limp hair beauties. The job of this cleanser is to provide you squeaky clean, lustrous and voluminous hair. To be honest, I feel that it is not made for all hair types😞 Although, it thoroughly cleansed my hair but I felt that it made my frizzy hair ends more rough and parched. So for dry hair, it has to be combined with deep conditioners or leave-in conditioners, but don’t miss any! If not used with conditioners, it worsens the hair condition making hair more dry, frizzy and brittle. However, this cleanser is a boon for oily, limp and thin hair beauties. It adds volume and bounce to the hair, which looks excellent. Regarding hair fall, it didn't help me either😭 It doesn’t produce much lather and smells exactly of banana fruit (so tempting 😋). The texture is also quite similar to the fruit, a soft & mousse but when mixed with water, a pale yellow liquid solution is formed. Ingredient List is not fully mentioned! 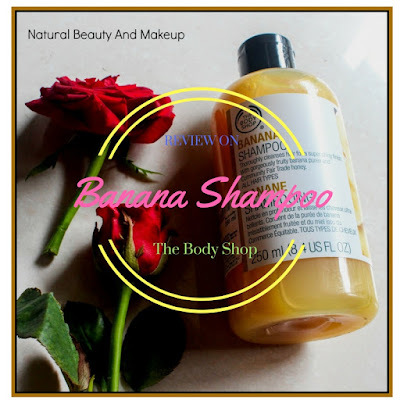 Although I haven’t tried this cleanser with banana conditioner, the shampoo alone provided me with a clean scalp and refreshed hair. It worked amazingly when combined with apple cider vinegar or any deep conditioner. If you are looking for a good voluminous shampoo, then give this cleanser a try! Have You Ever Tried The Body Shop Banana Shampoo? If Yes, Then Please Share Your Experience With Me In The Comment Section Below. What an amazing review..by the way dear ..have you tried to lift the label that has an up or lift sign as I can see in the 3rd picture.. 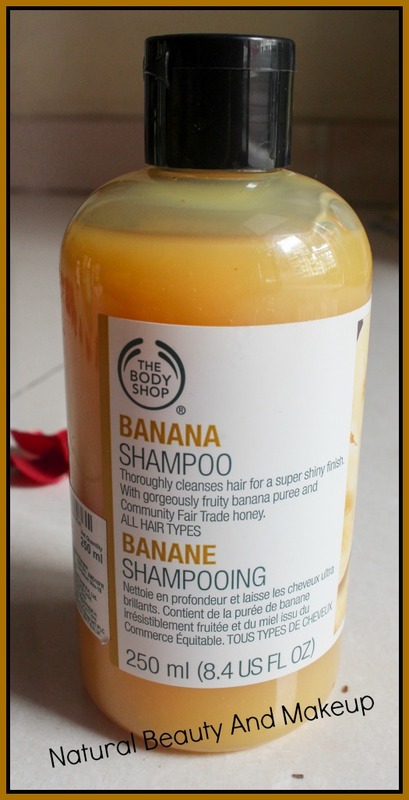 There are enough reasons to go bananas over this shampoo however, it is on the pricier side. Wow looks like a good shampoo, I have very thin hair..but two things I am worried about is no shine and no hair fall protection. 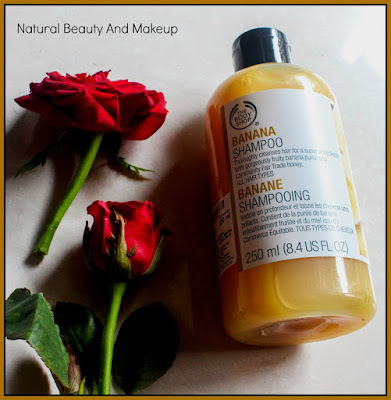 I have never tried TBS products :( On reading the term 'banana' I thought its gonna be hydrating and weigh down my hair but seems its meant for my hair type :) Thanks for the review! My boyfriend likes this, but I find it dries out my scalp. Nice review! A very detailed review! I have heard so many good reviews about this shampoo! I like the conditioner from this range far more than the shampoo. It definitely adds volume and softens my tresses. 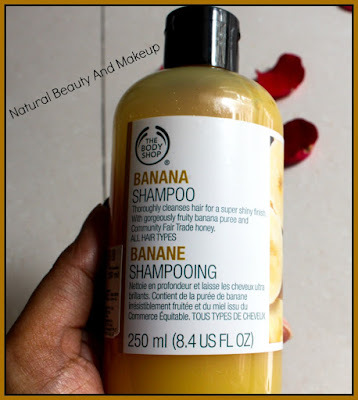 This is one of my favorite shampoos and i use it with its partner banana conditioner, it works better that way..you are right it can make hair dry if used on non oiled hair and not followed up with conditioner, specially in chilly dry weather... Initially j didn't like it because it made my hair detox of chemicals and then after that phase my hair were lively volumenous and all good things :).